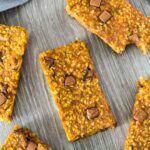 Pumpkin Banana Breakfast Bars – Deliciously moist and chewy soft-baked bars that are loaded with pumpkin and banana flavour, and full of chocolate chips. A perfect breakfast or on-the-go snack! 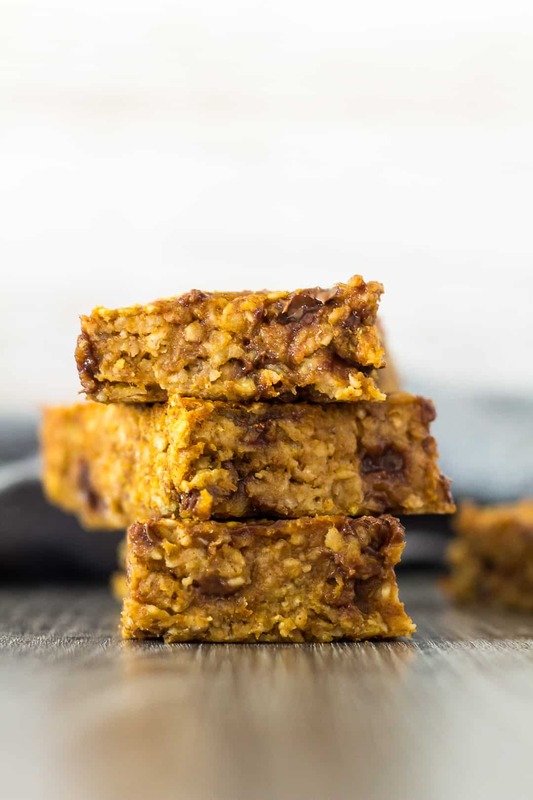 I bring you a recipe you’ll want to start any chilly autumn morning with – Pumpkin Banana Breakfast Bars! 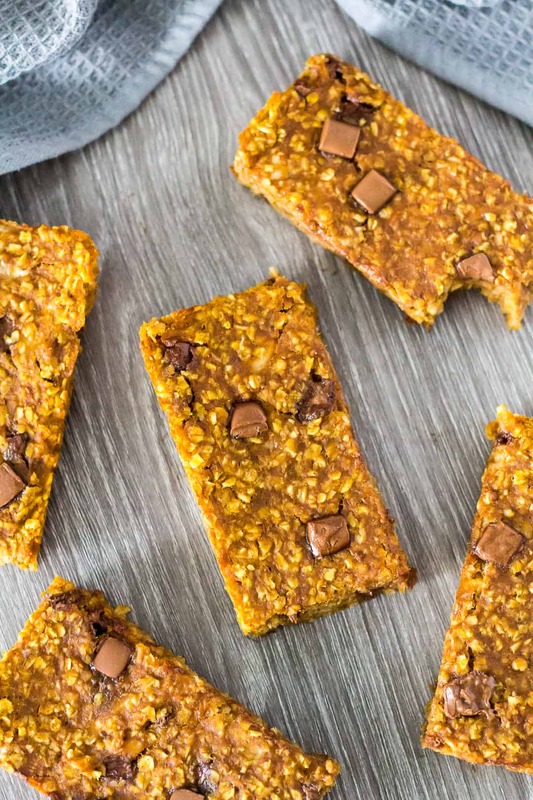 These soft-baked breakfast bars are moist, chewy, loaded with pumpkin and banana, stuffed full of chocolate chips, and BIG on flavour. What more could you want out of a quick breakfast or on-the-go snack? They are super quick and easy to make, and you can make them the night before so they are ready to be enjoyed the next morning! Bananas: You’ll need two large bananas. Honey: You can also use maple syrup or agave. 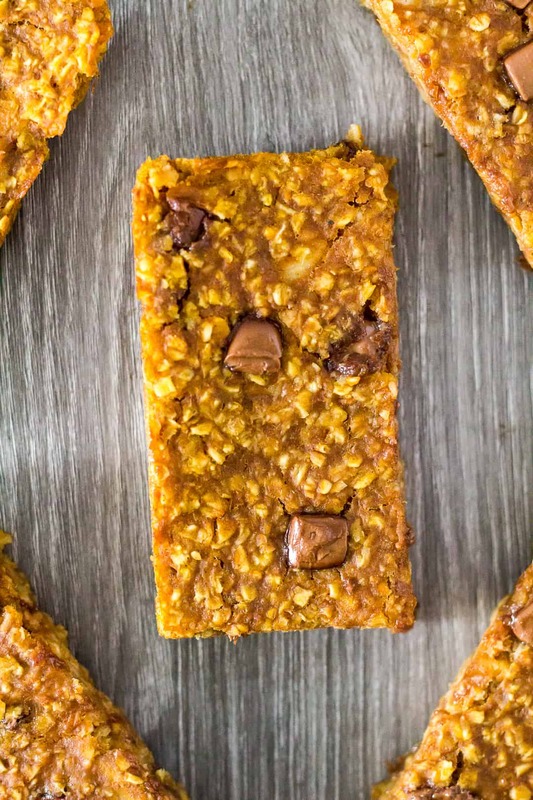 To make these delicious breakfast bars, simply whisk together the mashed bananas, pumpkin puree, honey, vanilla, and spices. Fold in the oats and chocolate chips. Transfer the mixture to an 8×8-inch square baking pan lined with parchment paper or foil, spread out and smooth out the top. Sprinkle with extra chocolate chips if desired. Bake for 30 – 35 minutes until firm and golden brown around the edges. Allow to cool completely in the pan on wire rack before cutting into bars. Want to try different add-ins in these breakfast bars? Instead of chocolate chips, try adding chopped nuts. They add an irresistible crunch to these soft-baked bars! Can I freeze these bars? Yes! These bars freeze well for up to 3 months. Thaw overnight in the fridge before serving. 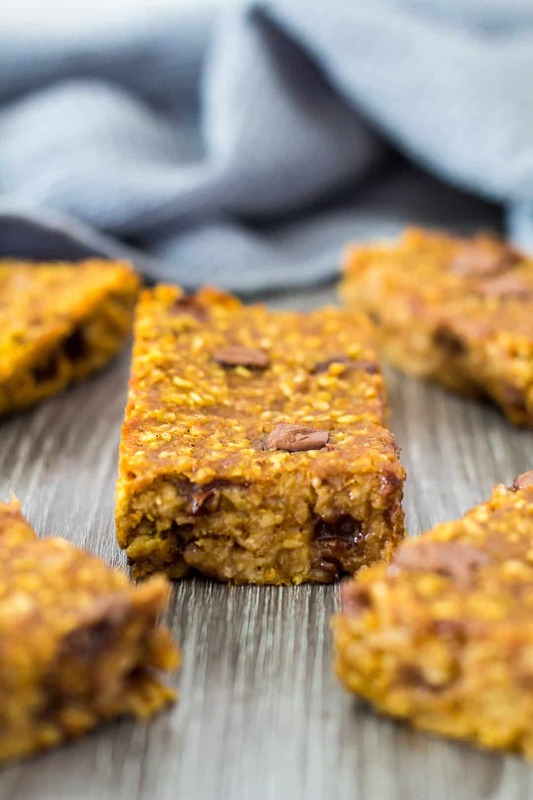 Deliciously moist and chewy soft-baked bars that are loaded with pumpkin and banana flavour. A perfect breakfast or on-the-go snack! In a large bowl, whisk together the banana, pumpkin, honey, vanilla, and spices. Add the oats and mix until combined. Fold in the chocolate chips. Transfer the mixture to the prepared pan, pressing lightly until evenly distributed. Bake for 30 - 35 minutes until firm and golden brown around the edges. Allow to cool completely in the pan on wire rack before cutting into bars. The calories are an estimate only. 205 calories for 9 long bars, as pictured. These are a great grab-and-go breakfast that isn’t at all messy to eat as I’m driving or walking. Thanks so much for this tasty recipe. It’s that time of year when I want ALL things pumpkin including breakfast! Haha I love how portable these bars are!